Start your engines… He’s back ! 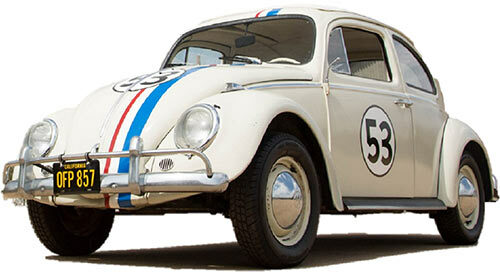 Herbie is Disney’s sentient 1963 Volkswagen beetle with a lot of heart. Today, Herbie would be considered a sleeper car . This is the second profile in a series, so you need to have read the first Herbie character profile. 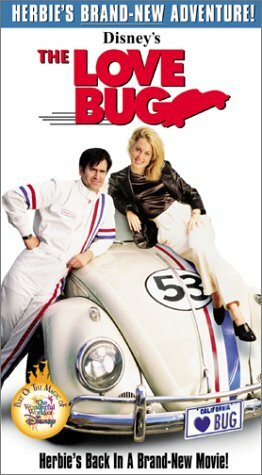 In 1997, Bruce Campbell and Herbie take on an evil Herbie clone called Horace. 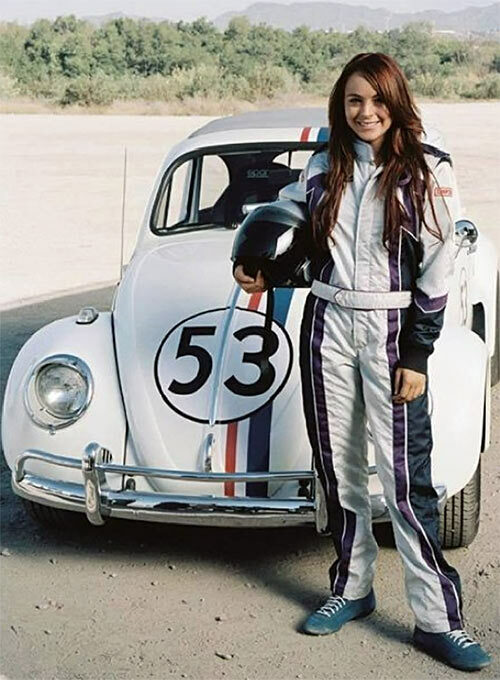 Then in 2005, Herbie and Lindsay Lohan take on NASCAR competition. Group Affiliation: Peyton Racing team. Length: 13’4″ Weight: 1800 lbs/816kg (6APs). 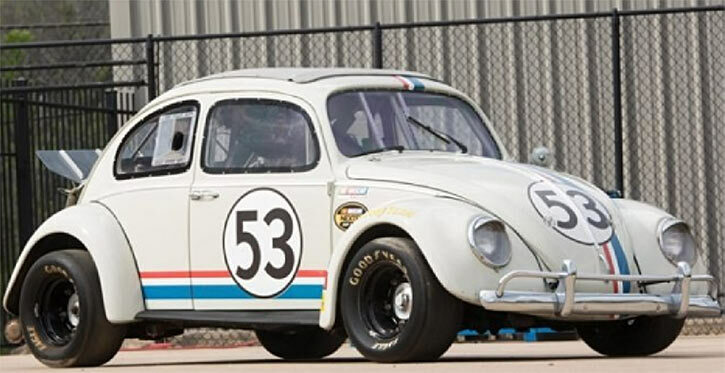 Herbie was still racing after more than 30 years. He had a new driver, an obnoxious Scotsman named Simon Moore III. In contrast to Herbie’s earlier performances, they finished dead last. Simon condemned him to the junk yard. Meanwhile, Hank Cooper was yet another washed up race car driver now working as an unmotivated mechanic. Hank’s poor work ethic caused his boss to force him to enter a fix-up challenge or face unemployment. Hank picked Herbie, one of the junk cars. Contestants had to get their vehicles running in a short time then race one lap. Alex Davis from Car and Drag magazine, (ahem) love interest, was a judge at the event. With Hank needing help, Herbie took off with a wheelie and won for him. Part of the prize was keeping the repaired car, so Hank got Herbie. At a stoplight, some young guys with a low rider showed off their hydraulics. Herbie, not to be outdone, matched the other car’s movements despite lacking hydraulics system. Both Alex and Simon became obsessed with figuring out how Herbie does what he does. 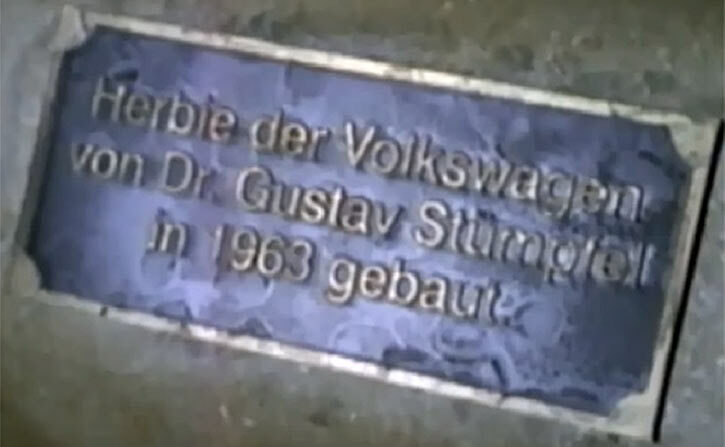 Under the hood, a small plate tells the name of Herbie’s inventor; Dr. Gustav Stumpfel. In the late 1930s, Dr. Stumpfel had been tasked by the German government to produce an easy to drive, easy to maintain, people’s car. After the war, the American’s wanted him to do the same for them. Except they wanted a car that *literally* was people – a person. The misunderstanding seemed intractable. After years with no success, the doctor accidentally knocked a picture of his wife into the liquid metal bath. The strong love he felt for his wife went into the very metal that would make up the car’s body. Herbie lived. Once he heard this story, Simon asked Dr. Stumpfel to build another little car. And he did, enhanced by a photo of someone Simon loved. Himself. Horace was born. A dark and malicious twin to Herbie. Horace and Rupert, Simon’s get things done guy, found Herbie alone in a short dead end alley. They smashed him to bits. At Herbie’s funeral, hope came in the form of Dr. Stumpfel and Jim Douglas. They would rebuild him. Herbie would live again. This was no small task. Stumpfel explained only his original parts could be used. Hank worked without rest until Herbie was complete, and could thus live again. When Simon saw Herbie intact, he challenged Hank to a race at dawn. The winner would win both little cars. Horace used deadly modifications during the race, including a laser to cut Herbie in two. Even so, Herbie won and since he was cut in two, won both first and third… again. Horace destroyed himself when, in a rage, drove right over the edge of a cliff and exploded. Margaret “Maggie” Peyton, was the first in her family of race car drivers to graduate college. Her brother Ray Jr. was the latest Peyton to represent family and team in NASCAR, and Ray Peyton, Sr. was the race team leader. But Maggie’s brother was a failure, often crashing his car. As a graduation gift, Ray Sr. took his daughter to a salvage yard to buy a car. She purchased Herbie, and took him to a nearby shop. There, she met an old friend from high school, Kevin (love interest). Of course, Herbie showboated his speed for his new owner. But she was unimpressed – in fact, she was embarrassed. Herbie took Maggie to one of her old hangouts, a car show near the beach. Nextel Cup Series champion, Trip Murphy (new rival) became Herbie’s target. Some insults were thrown and a challenge made. Herbie and Maggie raced against Trip, and connected on the track. Maggie being an excellent skater, Herbie imitated skateboard tricks. He slid along a guardrail to get past Trip. This allowed Maggie to surprise everyone and beat Trip in a one on one race. With Trip’s pride hurt he put forth a two-day challenge to all comers. He was hoping for a rematch with Herbie. He got 200 applicants. But at the end of the day only one would get to challenge him. In the end, Herbie stood alone. A day before their race, Trip let Maggie drive his stock car, her dream car. He tricked her into racing for pinks . Her dream car on her mind, Maggie shouted during the race that she wanted to win so she could get that stock car. Herbie, hurt, stopped dead in his tracks. That very evening, Trip’s friend “Crash” sold Herbie into a demolition derby. Maggie, full of guilt and shame, came to the little car’s rescue. This solidified their friendship. She’d never race in anything other than Herbie again. Maggie took her brother’s place in the next Nascar race. His latest crash left him with no depth perception. There was only one car she’d be racing in – Herbie! Kevin, Ray Jr, and their team worked all night getting Herbie NASCAR-ready. As the race got underway, the competition roared ahead. This left the little 53 car in the dust. Herbie had to use some ingenuity to stay in the race. Lap after lap Herbie gained ground pushing his speed but took damage in the process. He and Maggie found themselves on the final lap trailing the lead car, Trip Murphy. Some quick braking caused Trip to crash and almost took them both out of the race. Herbie quickly drove up the catch fence to bypass the crashing cars ahead of him and win his first Nascar race. Herbie has the same look that he had throughout his early films. 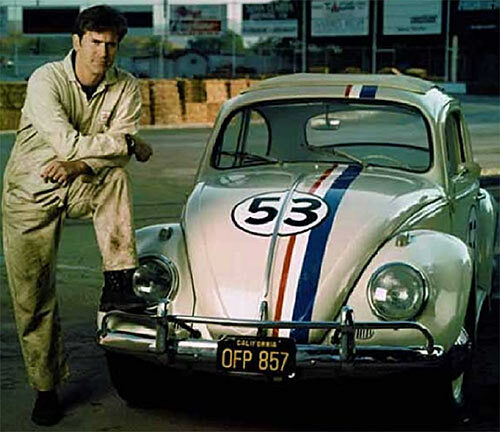 In the 1997 reboot an inscription with the name “Herbie” was on a plate found under his hood. This version of Herbie had enhanced facial expressions. The headlamps in this version actually act as Herbie’s eyes. His front bumper could move up or down a little to allow Herbie to grin or frown. Some fans of the original movies did not think this was a good change. His original speedometer was replaced with a new one going up to 200 mph. 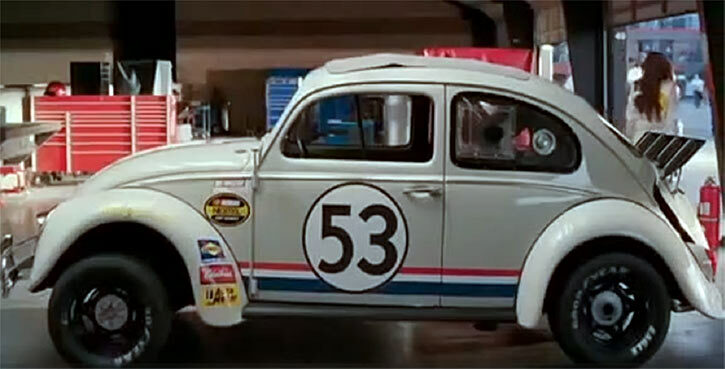 Herbie got a complete makeover for his NASCAR debut. At the beginning of both films Herbie was at a low point. His diminished motivation found him in the junk yard. Even at this low point Herbie had pride. When disrespected he’d spray oil or smoke, or whack the offender with a door or swinging hood. Herbie found new friends willing to help as much as they could. Once he realized he had a true friend, Herbie was again ready to fight for them. Herbie could be an addition to the re-imagined dystopian apocalyptic Wacky Raceland . Those characters and story adapted from Hanna Barbera’s Wacky Races . He and Jim Douglas would be another competitor racing for Utopia. Damage Capacity has the useable on others bonus. Only to Herbie’s occupants (+5). Extended Hearing is done by extending the radio antenna and bending it in the direction Herbie wants to over-hear. Fog: Herbie can blow smoke out of his engine or exhaust pipe, so much so, that it will cover a man in soot in seconds (+/-0). Projectile Weapons is contingent on Extra-Limb and requires an object of opportunity, Herbie is essentially throwing objects (-1 FC). Examples of this are bananas thrown from his doors and his spare tire launched at fleeing crooks. Running – see the (Herbie’s speed) section. Self-Linked Animate Object does have mental stats (+1). Acrobatics is Minimal Marginal (2 HPs to use). Vehicles skill can be used to aim any fluids he has at his disposal, water, oil, whatever. Since the skill usually covers a vehicle’s weapons. Familiarity (Roadways he’s driven on), Schtick (Ammunition Freedom (5HPs refills the gas tank)), Miscellaneous Advantage: Herbie is sometimes regarded as a person and a citizen. He was able to secure a passport to travel to Monte Carlo. Cannot Heal (may be repaired, 25 points), Minor Irrational Fear of large heavier vehicles (like an 18-wheeler), Minor Irrational Fear of being abandoned by those he loves, Power Loss: Running drops to 00 APs if out of gas/air to run the engine. Note: This does not mean Herbie can’t move! He can still move all his parts, even his wheels but use Running rules based on his Dex instead. Serious Psychological Instability: Depression (almost always triggered when he feels rejected and unloved). Inside Herbie’s trunk is a full-sized spare tire, jack and tire iron. When Herbie is on the track, whether going into the pits or carrying a mechanic with him, treat as if he has a Repair Kit (pg. 174 BOH: SE). First, if there is ever a Weapons Locker-like article made for vehicles, perhaps with Peter’s rules for Acceleration and the like, Herbie will need to be standardized to that article. Though Herbie is not your every-day VW Beetle. Herbie is a Compact Car [BODY 06 STR 04, Running: 06, R#2, Cost: 48] per BOH:SE. His Running power is easily 07 APs. This matches Racing Cycles and Sports Cars. Remember that Herbie is his own character, he can use his Hero Points to push his Running. What he does in the racing scenes are incredible but are only a gain of a single AP over the other cars. Running speed never exceeds 08 APs but he can perform stunts that exceed this. Like running on top the water or along vertical surfaces. Running: If Herbie’s Running fails when pushed, the Running Power will not fall to 00 APs. Instead his current BODY is attacked with APs of Running. Damage usually isn’t resisted with LDD. Herbie saves his HPs to push his speed. The GM is encouraged to deal out the damage in dramatic ways. Herbie loses a tire, his frame begins to crack, stuff like that. There is a scene where Herbie drove right into a small pond. Instead of sinking, he skips across it like a stone. This uses the “running on top the water” feat (pg. 153 BOH:SE). In Herbie goes to Monte Carlo, he drives into a similar body of water. Instead of skipping along the top he sinks and must navigate his way underwater. Herbie races along a wall to bypass some cars blocking his way. According to speed rules for doing this sort of stunt Herbie needs to be going 14 APs of speed. Which means pushing his Running and getting 21 on his die roll putting him in the All column (+7 RAPS). Herbie can spend Hero Points to boost his AV as well to make this easier. Herbie accomplishes this trick in three separate films. The second example, he races along the top of a tunnel and barely overtakes the other racer. A third example while racing in a NASCAR race, Herbie drives onto the catch fencing to avoid a crash. Wouldn’t it be easier to give him powers like Cling to run up walls or Air Walking for the water skipping? Sure, but Herbie rarely does these and often can’t or won’t. I don’t think this should be something he can do all the time. So, forcing him to push his speed to climb walls or run on top the water works. Herbie lowered himself out of a tree and landed safely on the ground. I’ve given him Acrobatics (Climbing). This actually helps explain some other things. Herbie tried to climb over the edge of the Golden Gate Bridge. Later, he climbed up some cables of that same bridge. I’m giving it the Minimal Marginal Limitation. If he used this all the time Herbie never would’ve got stuck on a porch in the second episode of the 1982 TV series. 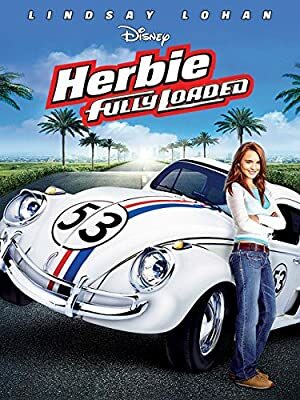 Herbie may have had the innocent drawback in the first half of the first movie but that’s all. I considered giving him Area Knowledge but he doesn’t have the full advantage. He doesn’t know the area customs, inhabitants, or important residents. Instead, I gave him a Familiarity with the roadways he’s driven on. As to Jim Douglas’ driving ability. At the start of the first movie, he’s washed up but used to have real talent. I put him at the high end of 04 APs but with the Uncertainty Drawback. He states he’s half a man. After winning several races his confidence returns. He removes the drawback and possibly gains an AP in Vehicles to boot. Although it’s hard to tell since he’s racing in Herbie. A few driving scenes are sadly sampled from earlier movies. The use of Herbie’s radio antenna as a listening device first appeared here. Herbie’s horn got some new tunes too, like, “Here comes the Bride”, “For he’s a jolly good fellow”, and “Happy Birthday”. He also knew Morse code for S.O.S..
Herbie was quite diminished in his abilities in the series. After leaving racing, he only had around 10 Hero Points and almost never pushed his speed. A few things changed about Herbie’s past. He wasn’t a special car from a production line where thousands of cars are made. Instead, Herbie is unique. Created by a German scientist for the Americans in 1963. The Doctor explained after being damaged, Herbie must be rebuilt with only his original parts. Else he will lose his essence. He’ll lose what makes him, him. This was ignored in all films except the 1997 reboot. Obviously, Dr. Stumpfel was wrong when he surmised that Herbie had to be repaired only with his original parts and metal. Hero Points were still at 10 HPs in 1997 but came roaring back to 25 HPs in 2005. 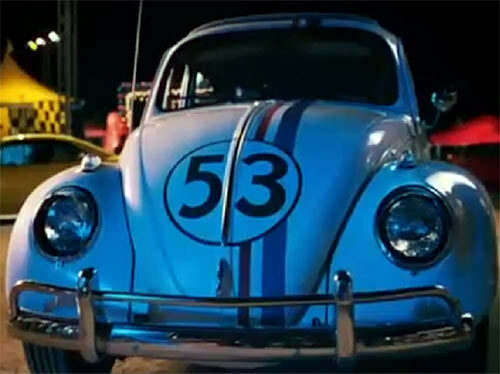 Source of Character: the 1997 The Love Bug, and the 2005 Herbie Fully Loaded.